As it’s highly rewarding, starting a commercial bananas farm is rather straightforward. Because of its local and international demands, you can even export a huge amount of bananas. Thus this is not only attracting lots of foreign exchange but providing job opportunity for locals as well. Once the plants established, they continuously propagate and produce young ones. And it’s a continuous trend of growth, harvesting, and sales that you’ll get from banana trees. For these, your farm requires you appropriate land, fertile soil and proper irrigation. And if you have the knowledge of growing techniques and quality suckers then it will provide a bountiful yield. However, banana plants prefer tropical climates and they are group plants along with self-propagate. You can be rest assured that there are loads of business opportunities in the industry and a commercial bananas farm is one of them as an aspiring entrepreneur who is interested in starting a business in the agricultural sector of the economy. As it’s very nutritious, it’s known to be one of the healthiest snacks around and has a great demand. From the weather to land, all are suitable for banana farming in Bangladesh. Also, it’s an easy business venture as it doesn’t require much technical knowledge. Besides, it needs not a big amount of investment while starting the business. So, these all are in favor of this business, why are you waiting for? Simply continue reading and follow them to start a commercial banana farm. Before you jump over to start a commercial bananas farm, it’s important you learn how to farm banana. From the growth pattern to best planting season, soil composition and pest control, all are essential to understanding nicely. Apart from these, there are many more things to learn, including harvesting, complementary plants, irrigation methods, and marketing etc. Well, let’s know some steps that are essential for a commercial bananas farming business. 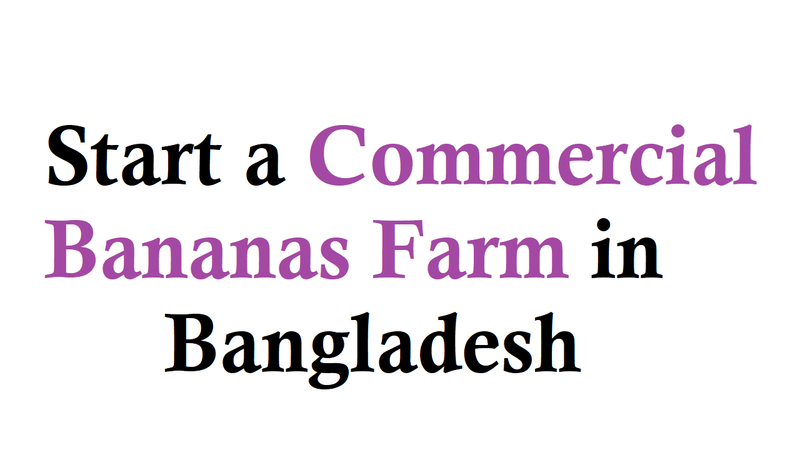 You need to write a business plan regarding a commercial bananas farm before venturing into the business. Also, carry out a feasibility study of your locality when you have written the plan. Not only for this business but for any other business is mostly dependable on a well-researched business plan. This is the key and the most essential step than any other steps. As banana plants are found in the tropics and require good composite soil, the farmland should be properly irrigated with proper drainage system and organic fertilizer soil. Also, when the plants are seasonal and produce a large bunch of fruits per plant, they also require shade plants, humidity and rainfall to grow. So, it’s important to provide the plants their proper farming environment while you’re in a commercial bananas farm. Banana plants in most countries influence by some factors that limit production. From inadequate farmlands to poor maintenance, these include low income of farmers and unavailability of startup funds and many more. Also, a commercial banana farm may limit the production by poor harvest are pests, drought, low rainfall, and infestation. Apart from these, there is low access to organic fertilizers, poor farming techniques, and low-quality suckers. So, you must avoid these in order to get good production of banana as you expect. Because banana plants grow well during the rainy season, transplant the suckers just before the advent of rains is important. So, you should plant them 5 meters apart, but make sure the roots are tendered and soil adequately moist. Moreover, you should consider removing all types of unwanted things like shrubs, grass or competitive plants. Before planting bananas, it’s important you provide a good layout. Because the field should be cleared of shrubs, stones, weeds, and roots, develop a planting and spacing system and appropriate proper planting materials. Staggering the planting of the suckers, serious banana framers use the method. This is because to achieve fruiting at different times to have a regular supply of fruits for the market. Besides, you should make sure the plants receive adequate water to achieve bountiful yield. And if you employ casual labor to weed then you tens the plant for maximum yield. Also, focus only on safe organic farming methods and refrain from using any synthetic chemicals on your plants. As the fruit is used in manufacturing companies, restaurants, fruit markets, and stalls, there is a huge market for banana produce locally and internationally. Also, it not only has domestic but international demand as well. And depending on the size of your harvest, quality of produce, price, and location, you can make money. A commercial bananas farm need to provide an effective irrigation system. Moreover, adequate water and an effective drainage system are most important for the proper growth of the plants. If we talk about the growth duration then there is new verities of plants are steadily being developed in the laboratories to produce larger and faster yield. And you get bananas from every grown banana plants for at least once a year. But, it’s surprising that the plant propagates, dies and produces new plants upwards of 15 years.